Building overpasses over busy highways in notable spots where animals cross make a lot of sense in terms of safety of people and the animals. We have seen several near Wells, Nevada and reported on them. Now one is nearing completion over Interstate 80 at Wendover, Nevada-Utah. It is 200 feet wide and cost 2.7 million dollars. Fences direct the migrating animals toward the crossing, which is wide enough that they tend not to be frightened of the speedy vehicles beneath. AP story in the Las Vegas Sun. Properly constructed they can reduce the number of collisions to next to nothing. Perhaps the most celebrated such crossing went up recently about five miles west of Pinedale, Wyoming (see photo below). It spans U.S. 191 to help the fabled pronghorn herd that migrates from Grand Teton National Park hundreds of miles southward to winter on the Red Desert of Wyoming. Development had just about chocked off the migration at a constriction point on the highway crossing near Trapper’s Point. The new bridge, of which the Utah-Nevada bridge is the same style, seems to be a success. I examined the U.S. 191 structure recently (see a photo of the Wyoming bridge to the left). In the pronghorn crossing, two fences extend about a mile in both directions, one on each side of the highway. They are about a tenth of a mile back, parallel to the highway. This prevents the pronghorn from crossing elsewhere from the traditional point. There are also ancillary fences. In the middle of both fences, a cone-shaped turn of the fence directs the pronghorn to the crossing bridge. From the air it looks like an hourglass. You can see it on Google Earth or maps. We hope for more of these. They have these in Canada ,that’s where I heard of them first. Above Montana I believe ? Article sated Canada was first !U.S. would be wise to follow ! The US has been following. In fact, enough of these have been thought about and deployed that there is an entire handbook devoted to it. One thing I do remember they were talking about overpasses and under passes. The over passes were for grizzly bears, they like open fields . Others bears like to walked under cover like cliffs and such. Hey I don’t know if this is true but they made over and under passes for certain animals. I wonder if the insurance companies are making any “contribution”? Aside from human lives (I’m sure they couldn’t care less about loss of wildlife), seems they stand to save a ton of money. Not to mention hunting groups who no doubt will celebrate more living targets. Which brings to mind it wasn’t about wildlife, but the train crashes caused by wildlife. Thanks Ralph for the link and the article and thanks sb for your input. It’s fantastic news, to be sure. What I don’t get is how they can cost 2.7 MILLION dollars. I would love to see a price breakdown for that. It seems like such a high cost would be a major stumbling block to system wide implementation. Would the cost be mitigated if it were part of new infrastructure projects from the beginning? Are there legal ways to force including wildlife mobility into new project designs? So many questions. Several years ago my son spent several months one winter surveying for potential wildlife overpass/underpass locations on and near Snoqualeme Pass on I-90 east of Seattle. I don’t know what, if anything, became of it. I’ll try to remember to ask him. 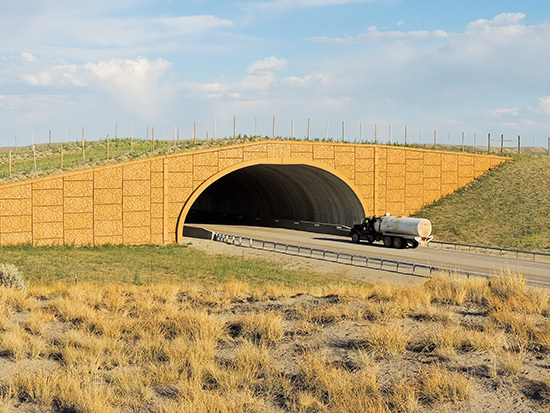 I was impressed with the corridors for amphibians and canopy users shown in the Wildlife Crossing Structure Handbook. It also showed design for smaller passages in side larger ones. Thanks, Ralph. And food for thought: Utah just raised their speed limit to 80 mph and you will notice deer crossing signs in those same sections of highways. This should create some interesting statistics.